In an increasingly connected world characterized by faster product-development cycles, companies continuously seek new ways to get to market sooner and to improve products throughout their life span - from production and manufacture to remote access in the field. To address this requirement, ARM is introducing ARM CoreSight SoC-600, our next-generation debug and trace solution. This new technology offers debug and trace over functional interfaces such as USB, PCIe or wireless, reducing the need for hardware debug probes while increasing data throughput. Designers can now get to the root of the problem faster, reducing iterations, risk and TTM. Furthermore, it also offers OEMs and developers unmatched system visibility across a device’s lifetime, in a world where development and optimization never stops. Historically, SoC debug and trace has depended on dedicated and standardized external interfaces to provide device access to external debuggers, most notably via JTAG (IEEE-1149.1) and Serial Wire Debug. But relying on these interfaces limits the availability and accessibility of debug features to the early stages of the product lifecycle, as these connections are rarely accessible in finished products. 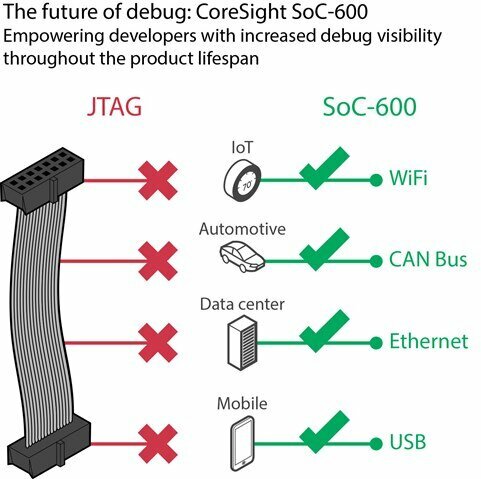 To remove dependencies on such standards, CoreSight SoC-600 implements the latest ARM debug and trace architecture, which provides developers with high-throughput trace and infield debug accessibility, via existing functional interfaces. SoC designers - with co-developed IP and tooling for maximum productivity in the design phase. Developers – ease of debug access thanks to readily available, validated SW drivers and debug tools. CoreSight SoC-600 has been designed in close collaboration with the ARM IP portfolio, DS-5 Development Studio and the ARM tools ecosystem. STMicroelectronics is among the first licensees of CoreSight SoC-600. Together with ARM’s extensive tools ecosystem, CoreSight SoC-600 is built on decades of debug heritage and provides designers with complete confidence in design compatibility and support. Early access to CoreSight SoC-600 is available for lead partners now. ARM will demonstrate CoreSight SoC-600 and DS-5 Development Studio live at embedded world 2017 (Hall 3, booth 3-342). Come along and witness the future of debug yourself.